Path: Aktualności - Towarzystwo Wieniawskiego (en) / Gidon Kremer & Clara-Jumi Kang – concert in Poznań | 30.06. Fot. Kremer Gidon © Paolo Pellegrin, Magnum Photos. On June 30th this year Gidon Kremer performed in Poznań with Clara-Jumi Kang, an extremely talented violinist of Korean origin, born in Germany, winner of many prestigious violin competitions in the world (first prizes in Seoul, Hanover and Indianapolis). Program of the concert was composed of musical pieces by J. S. Bach, M. Weinberg, L. Nono. 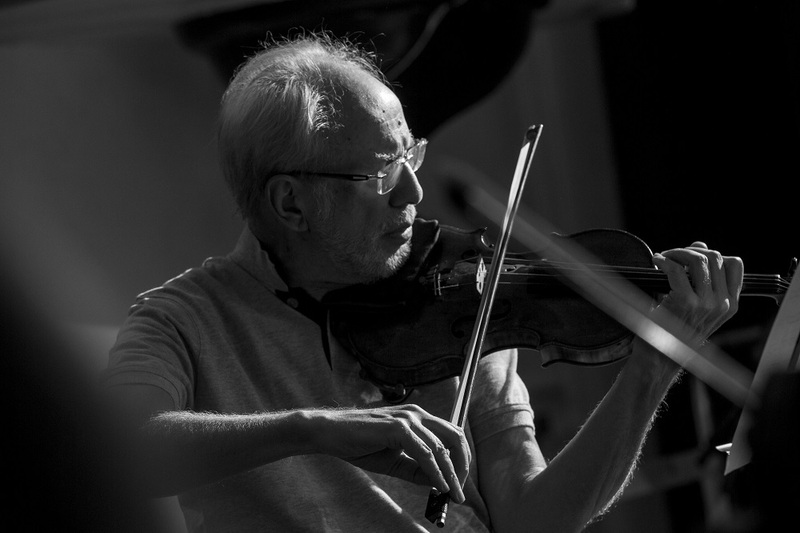 Driven by his strikingly uncompromising artistic philosophy, Gidon Kremer has established a worldwide reputation as one of his generation’s most original and compelling artists. His repertoire encompasses standard classical scores and music by leading twentieth and twenty-first century composers. He has championed the works of Russian and Eastern European composers and performed many important new compositions, several of which have been dedicated to him. His name is closely associated with such composers as Alfred Schnittke, Arvo Pärt, Giya Kancheli, Sofia Gubaidulina, Valentin Silvestrov, Luigi Nono, Edison Denisov, Aribert Reimann, Pēteris Vasks, John Adams, Victor Kissine, Michael Nyman, Philip Glass, Leonid Desyatnikov and Astor Piazzolla, whose works he performs in ways that respect tradition while being fully alive to their freshness and originality. It is fair to say that no other soloist of comparable international stature has done more to promote the cause of contemporary composers and new music for violin. Gidon Kremer has recorded over 120 albums, many of which have received prestigious international awards in recognition of their exceptional interpretative insights. His long list of honours and awards include the Ernst von Siemens Musikpreis, the Bundesverdienstkreuz, Moscow’s Triumph Prize, the Unesco Prize and the Una Vita Nella Musica – Artur Rubinstein Prize. In 2016 Gidon Kremer has received a Praemium Imperiale prize that is widely considered to be the Nobel Prize of music. In 1997 Gidon Kremer founded the chamber orchestra Kremerata Baltica to foster outstanding young musicians from the Baltic States. The ensemble tours extensively and has recorded almost 30 albums for the Nonesuch, Deutsche Grammophon, Burleske and ECM labels. “After Mozart” (Nonesuch, 2001) received an ECHO prize and a GRAMMY award in 2002, while their recent release on ECM of works by Mieczysław Weinberg was nominated for a GRAMMY in 2015. Maestro Kremer will lead Kremerata Baltica on landmark tours of North America and Europe in 2016-17 to celebrate the orchestra’s 20th anniversary and his 70th birthday year.